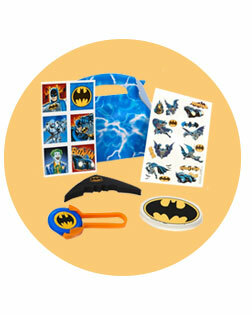 One of the original superheroes is here for your next big birthday bash when you get Batman Party Supplies! Party favors like masks, bracelets, tattoos, and favor buckets, decorations like table centerpieces, balloon kits, personalized banners, and tableware like cups, napkins, and plates help you recreate Gotham City for your little hero and all his guests! Throw Your Little Caped Crusader a Batman Birthday Party! Batman is one of DC Comics' first superhero creations. He’s been fighting crime in Gotham and inspiring fans everywhere for over 70 years. If your son loves everything Batman, including the countless comics, movies and cartoons, then a Batman theme for his next birthday party will make his dreams come true. Every detail counts when it comes to throwing an amazing party, which is why BirthdayExpress has a wide selection of Batman decorations, tableware, activities and party favors — all officially licensed by DC Comics. Whatever you need to throw a birthday party worthy of Gotham’s Dark Knight, BirthdayExpress has it. Let BirthdayExpress’ online store be your go-to shop for all your party needs. With your busy schedule, there simply isn’t enough time to run from store to store to gather your decorations, food and supplies. At BirthdayExpress, everything is just a click away. Planning a birthday party is a lot of responsibility, but the BirthdayExpress Ideas Blog is here to help. 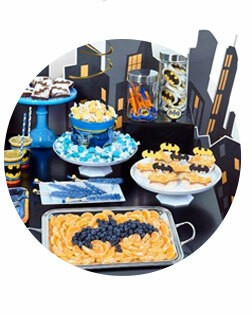 The blog has party tips and expert advice on everything you need to know for hosting an amazing Batman party. You’ll find suggestions on food, activities, decorations and more. Start your party preparations the right way with themed invitations. These Batman Invitations will make sure friends and family know the date, time and other details for the big day so they can get their capes and masks ready for an epic adventure through Gotham. From balloons and banners to pop-up cityscapes, BirthdayExpress has all the supplies you need to turn any location into the streets of Gotham where the Dark Knight brings the city’s toughest bad guys to justice. With decorations inspired by the original Batman comics, the birthday boy and his friends won’t have any trouble channeling the Caped Crusader and his crime-fighting team. Set the scene with some of these Batman-themed decorations, then sit back and watch the little heroes defeat the city’s most dangerous criminals. Every birthday party needs balloons. With the Batman Balloon Bouquet, you don’t have to settle for plain, everyday balloons. Featuring two square Batman foil balloons, two star foil balloons and six Batman latex balloons, this bouquet will fit right in with the rest of your Batman-themed party décor. 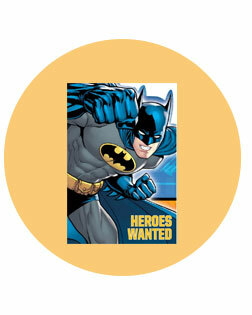 Make your little Caped Crusader feel extra special with the City Lights Personalized Vinyl Banner. Whether you choose a simple “Happy Birthday!” or a customized birthday message, your child will light up when he sees it hanging at the party. The banner is made with heavy-duty vinyl and comes in three different sizes to match your needs. Batman and his team deserve a hearty meal before they spend the night fighting crime. Fortunately, BirthdayExpress has all the supplies you’ll need to prepare the table for the grand feast. Start with the Batman Plastic Tablecover, then use the centerpiece, pop-ups and confetti in the Batman Table Decorating Kit to establish the theme across the entire table. Once those foundation pieces are ready, set the table with themed plates, napkins and cups. A themed cake topper featuring Batman riding his motorcycle out of the Batcave is also available to top off your tableware and food decorations. One of the most difficult parts of planning a successful birthday party is preparing activities. Keeping children entertained and happy isn’t always easy. Thanks to BirthdayExpress, you don’t have to stress over the activities anymore. A number of activities are already prepared to make sure partygoers have a great time, and they’re even customized to match the party’s Batman theme. Classic party games like a piñata and Pin the Tail on the Donkey are available, as well as costumes for dress-up and supplies for photo opportunities. A piñata is the perfect way to see your little hero and his friends in action. Once they find the right string, the Batman 3D Pull-String Piñata will release the toys and candy treasures you’ve hidden inside. This classic party game is sure to be a blast at your Batman-themed party. The Batman Party Game puts a themed twist on the classic Pin the Tail on the Donkey. In the game, the kids have to try and stick Batman’s famous emblem on the correct spot of his suit. The game comes with a large game board, a paper blindfold and eight emblem stickers. Capture all of the extraordinary moments of your child’s big day with pictures as epic as the party itself. The Cityscape Backdrop will provide an amazing background for photos of your hero and his guests. The cityscape can also be a stand-in for Gotham during playtime. A Batman birthday party wouldn’t be complete without the Dark Knight himself. The Batman Brave & Bold Deluxe Child Costume will allow your son to become his favorite hero for the day and make this birthday a truly memorable one. When the Caped Crusader and his friends are done saving Gotham for the day and it’s time for the heroes to go home, be sure to show your appreciation for their role in making the day special. They helped your son create lasting memories, and for that they deserve special thanks. Fortunately, BirthdayExpress has an assortment of party favors already prepared so you don’t have to do the extra work. Choose from delicious treats and toys that will let guests continue their crime-fighting adventures after the party ends. Fill favor container and send guests home with an assortment of gifts worthy of a superhero. Spending just one day as Batman isn’t nearly enough. 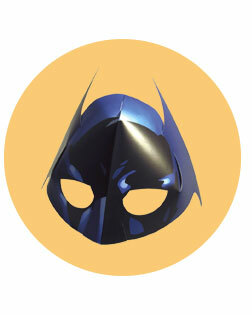 Give guests these Batman Dark Knight Masks so they can continue their time as the masked vigilante at home. You can also hand the masks out earlier in the party so the kids can add them to their costumes.